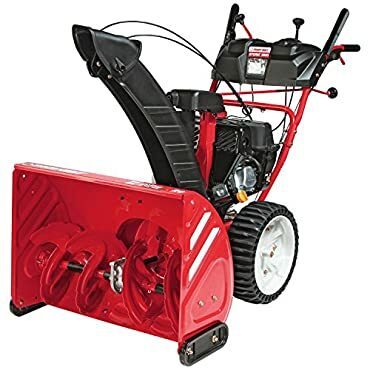 Looking for a powerful snow removal solution to ease your winter needs Look no further than the Troy-Bilt Storm 2890 243cc Electric Start Two-Stage Gas Snow Thrower. The Troy-Bilt 2890 Gas Snow Thrower is powered by a dependable 243cc OHV gas engine equipped with All-Wheel Drive for easy operation with 6 forward and 2 reverse speeds. This Snow Thrower is created with quiet engine technology for quieter snow removal, especially during the early morning hours. The Snow Thrower comes with Touch 'N Turn Power Steering and Just One Hand Operation for easy control so the machine can do the work for you. The chute rotates quickly for the operator to adjust to their desired direction and avoid blowback during usage. The Storm 2890's 15" x 5" tires provide traction and gripping even in icy conditions. The reflective strips and in-dash headlight are incorporated for safer operation in low-light conditions. The Troy-Bilt 2890 can clear snowy pathways up to 28" wide and is backed by a 2-year limited warranty. Last updated: April 20, 2019 at 23:48 EST. Pricing information is provided by the listed merchants. GoSale.com is not responsible for the accuracy of pricing information, product information or the images provided. Product prices and availability is subject to change. Any price and availability information displayed on amazon.com or other merchants at the time of purchase will apply to the purchase of the product. As always, be sure to visit the merchant's site to review and verify product information, price, and shipping costs. GoSale.com is not responsible for the content and opinions contained in customer submitted reviews.